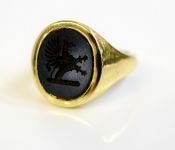 Discover our Fine Selection of Antique Men's Rings, Vintage Men's Rings and Estate Men's Rings Below. A distinctive vintage 14kt white gold ring featuring 1 straight baguette diamond, est. 0.18ct (VS2 clarity & G-H colour). A beautiful 10kt yellow gold ring featuring 5 round brilliant cut diamonds, est. 1.03ct (SI-I1 clarity & I-J colour). A distinctive 10kt yellow and white gold ring featuring 5 round brilliant cut diamonds, est. 0.15ct (VS1-VS2 clarity & G-H colour). A beautiful 14kt yellow and white gold split shank ring featuring 1 round brilliant cut diamond, est. 0.34ct (clarity:VS1 & H-I colour). A stunning Retro 18kt yellow and white gold ring, circa 1940, featuring 1 old European cut diamond, est. 0.40ct (clarity:VS2 & H-I colour).